The girls race was won by Middletown South senior Madison Brand, who obliterated her previous course best of 19:48, when she crossed the line with a 16 second lead at 18:39. That shot Brand up the rankings to #2 on the state course this season only behind Monica Hebner‘s 18:32 from Shore Coaches. Matawan‘s Rachel Kenny also broke 19 minutes with her 18:55 for second, ranked fifth on the course this season. 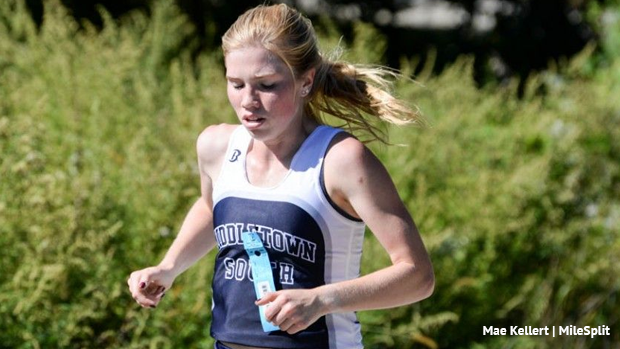 In the team battle Middletown South scored early thanks to Brand’s one card and Kathleen Shay finishing fifth at 19:35, they totaled 75 points after scoring 1+5+18+25+26. 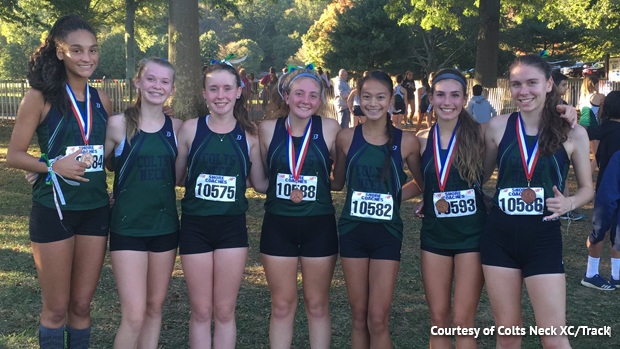 However Colts Neck had other plans and battled back with a 4+6+7+9+35 top five for 61 points and 19:53 average to win their second straight county championship. Colts Neck’s leading scorer Colleen Megerle finished fourth overall at 19:20 after a battle to the line with Monmouth Regional‘s Amanda Stone who finished third with 19:19. From there Colts Neck’sNatalie Shapiro finished sixth at 19:39, Delia Russo seventh 19:41, Eva Gibson ninth 19:48, and Lucy Gardner 37th 21:00. For the Boys Championship CBA made it 16 straight, winning this year’s title with 56 points and an average of 16:32. The win came off a 1-2 punch by Brian Hill and Ryan Miele who led the race with a 16:02 and 16:06, both are strong course PRs and broke them into the top four at Holmdel this season. The scoring line for CBA came through with 1+2+14+16+23; after Hill and Miele it was John Sheridan14th at 16:41, Justin Durney 16th 16:47, and Nick Rienzo 23rd 17:07. The Colts haven’t lost a Monmouth County title since 2001 when Red Bank Regional ended CBA’s previous 19 year run which started in 1982.